New Delhi: Indian investigators have begun the process of seeking fugitive jeweller Nirav Modi’s extradition after the UK confirmed his presence in the country during the weekend. The Central Bureau of Investigation (CBI) has sent an extradition request for Nirav Modi to the Union home ministry, which in turn will forward it to the ministry of external affairs for final action. The investigating agency has requested the UK authorities to detain Nirav Modi, with Interpol having already issued a red corner notice (RCN) against the diamantaire on 2 July. “The UK authorities confirmed Nirav Modi’s presence and CBI has now sent the extradition papers to the home ministry. CBI, through Interpol, has also informed UK authorities that Nirav Modi is to be detained, as a red corner notice exists against him," said a senior CBI official, requesting anonymity. Nirav Modi and his uncle, Gitanjali Gems promoter Mehul Choksi, are the prime accused in the ₹ 14,356 crore Punjab National Bank (PNB) fraud. 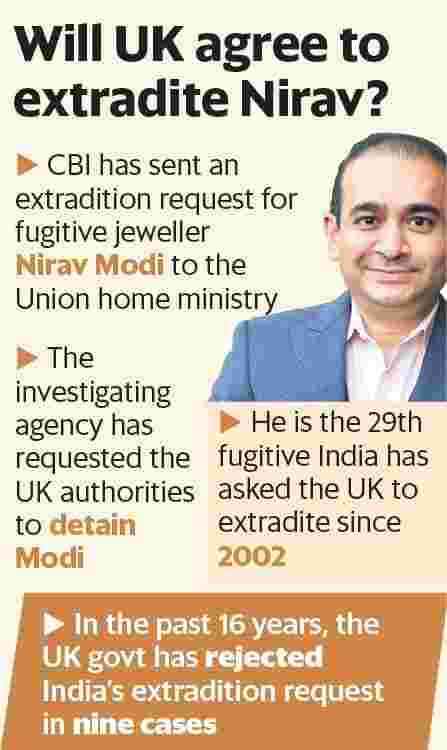 Nirav Modi and Choksi will take up to 29 the number of fugitives whose extradition India has sought from the UK since 2002. The UK government in the past 16 years has rejected India’s request for extradition in nine cases. The UK courts also declined to issue arrest warrants for three more fugitives whom New Delhi wanted London to extradite. This effectively ruled out extradition in 12 of the cases sought by India. In the case of 15 others, including business tycoon Vijay Mallya, extradition is still pending. In June, after the RCN was issued against Nirav Modi, his brother Neeshal Modi and their employee, Subhash Parab, the enforcement directorate (ED) moved a Prevention of Money Laundering court in Mumbai, seeking Nirav Modi’s extradition from the UK, Belgium and other countries, as his location had not been confirmed. Following this, India sought Modi’s extradition from the UK. Minister of state for external affairs V.K. Singh told the Rajya Sabha in July that the request for his extradition had been sent to the Indian high commission in London. The high commission then forwarded the request to the UK government. “The request of the enforcement directorate for extradition of Nirav Modi was forwarded to the UK Central Authority on 3 August 2018," MEA spokesperson Raveesh Kumar said. “This was based on the two RCNs issued by Interpol on the basis of requests made by ED. We are waiting for the response of the British government on this matter." On 6 August, India also formally handed over the extradition request for Choksi to the authorities in Antigua and Barbuda, after the Antiguan government confirmed that he had taken up citizenship in the Caribbean country in January this year. At the same time, a special CBI court in Mumbai granted bail to former PNB managing director and chief executive officer (MD and CEO) Usha Ananthasubramanian. She was named in the CBI charge sheet in connection with the fraud, alleging that she had failed to exercise proper control over the functioning of PNB while serving as the bank’s MD. In May, Ananthasubramanian had been divested of her powers as MD and CEO of Allahabad Bank, following which the Union government last week gave CBI and the Reserve Bank of India permission to prosecute and initiate criminal charges against her.